Let's have a simple diagram to see how they all fit together to form a database management system. 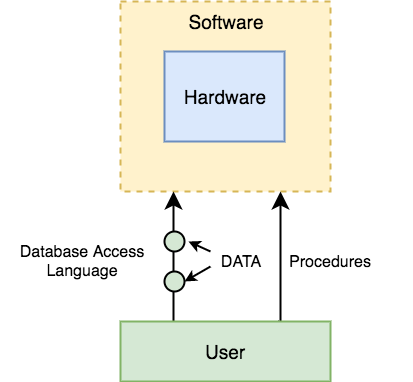 When we run Oracle or MySQL on our personal computer, then our computer's Hard Disk, our Keyboard using which we type in all the commands, our computer's RAM, ROM all become a part of the DBMS hardware. The DBMS software is capable of understanding the Database Access Language and intrepret it into actual database commands to execute them on the DB. Data is that resource, for which DBMS was designed. The motive behind the creation of DBMS was to store and utilise data. In a typical Database, the user saved Data is present and meta data is stored. Procedures refer to general instructions to use a database management system. This includes procedures to setup and install a DBMS, To login and logout of DBMS software, to manage databases, to take backups, generating reports etc. User can create new databases, tables, insert data, fetch stored data, update data and delete the data using the access language. Database Administrators: Database Administrator or DBA is the one who manages the complete database management system. DBA takes care of the security of the DBMS, it's availability, managing the license keys, managing user accounts and access etc. Application Programmer or Software Developer: This user group is involved in developing and desiging the parts of DBMS. End User: These days all the modern applications, web or mobile, store user data. How do you think they do it? Yes, applications are programmed in such a way that they collect user data and store the data on DBMS systems running on their server. End users are the one who store, retrieve, update and delete data.